Electric cars have become once again one of the most popular modes of transport after a gap of nearly a decade, because their carbon emission levels are quite low, cause less pollution and are eco-friendly. Many owners of gasoline-powered cars prefer to convert their cars into electric vehicles on their own at home rather than going in for a new electric car as conversion costs are significantly low. Electric car conversions are generally regarded as Do It Yourself (DIY) jobs. However, converting a car to electricity-driven one is somewhat difficult, but not altogether impossible. One should equip himself with proper knowledge so that the chances of errors are minimized and conversion costs will be kept low and will ensure a hassle-free conversion. In other words, a comprehensive manual or a guide makes the task of conversion much easier. The Electric Vehicle Conversion Handbook written by Mark Warner is very useful guide for those interested in converting their cars into electric vehicles. The systematic approach to car conversion elucidated in the handbook is what makes the handbook very useful. In the opening chapters, Warner explains about electric cars and their advantages and disadvantages. The book does not highlight about the drawbacks of electric cars but rather focuses enthusiastically more about the immense benefits that electric cars can offer. After the preamble, Mark Warner proceeds to help the reader in taking appropriate decisions regarding converting a car into an electric vehicle. He does this by raising a number of pertinent questions and presenting various scenarios so that making a right decision becomes easier. After that, the author moves on to enlighten how one should choose a chassis, or a car for conversion. On the face of it, though it might appear a simple and straightforward job, in practice, it is not so, as several aspects need to be considered. The handbook explains in lucid style various aspects that require careful evaluation before a vehicle is selected for conversion. Warner then discusses about the various parts needed for conversion and the functions of each component. This portion is the most important part of the handbook. For example, everyone knows that an electric car requires an electric motor but how do you choose the right one. The same thing applies to other parts, such as the controller, the charger and obviously, the batteries. The author narrates in The Electric Vehicle Conversion Handbook the theoretical aspect of each part, why they are required, what are their functions and different types of each one of them. For example, when we talk of batteries, he discusses merits and demerits of lead acid batteries vis-a-vis lithium batteries. This facilitates proper understanding of the advantages and disadvantages of each component so that one will be better placed to take a conscious decision regarding conversion of his existing vehicle to an electric car. Finally, the Mark Warner illustrates nine different vehicle conversion jobs. These projects consist of an extensive range of vehicles, like a bicycle, a motor cycle, a truck, a van and also a few sports cars. More than anything else, these illustrations are fine examples to explain that any job can be completed successfully with careful planning. The hand book, however, does not provide any step by step instructions for converting a car as it would be very difficult to explain about large variety of cars and numerous components in each type. On the other hand, the handbook educates all those looking for converting their cars into electric cars on various factors involved in the vehicle conversion process and how to make a well-informed decision. On the whole, the handbook is a very valuable guide to all those considering conversion of their present vehicle to electric car on their own. Click on the button on the right to get a copy of Mark Warner’s book from Amazom.com/. Riding electric vehicle is different with driving a standard vehicle. It is true that EV driver must be equipped with more knowledge about the vehicle so they will not doing some mistakes when operating this car. 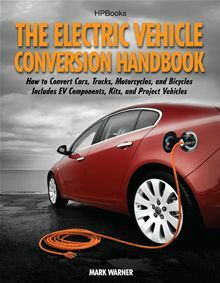 I think this book would be very beneficial to the EV drivers, it seems that I also need this book because I am very interested to learn (and hopefully riding too) an EV. Hopefully.